Few things are more inspiring than the dedication of an Olympic athlete. Every four years, we are reminded of the heart, the hope and the home team pride that goes into qualifying, training, and performing on the world stage. As we watch from the stands or from the comfort of our homes, it is almost impossible to avoid getting pulled into the action… Who hasn’t found themselves unexpectedly cheering out loud at one of those “hundredth of a second” wins? 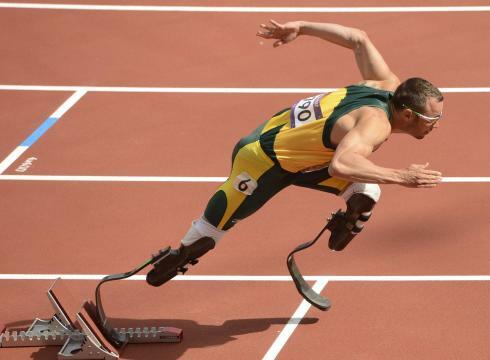 Arguably, even more inspirational, the 2012 Paralympic athletes prove that a disability does not hinder athletic dreams. In honor of the 2012 Paralympic Games, which will take place in London from August 29 - September 9, we’ve compiled a list of the events that will take place this year. Archery: Archery has been on every Paralympic program since the inaugural Paralympic Games in 1960. This year, nine different events take place at the Royal Artillery Barracks. Athletics: Athletics is the largest sport on the Paralympic program this year, with 1,100 athletes competing for the gold in 170 events. Boccia: Individuals, pairs and teams, across a variety of classifications, compete in seven medal events from September 2 - 8. Great Britain is the defending champ for the Team event. Cycling, Road & Track: Road Races, Time Trials, and a Mixed Team Relay make up the road events, while track consists of Individual Pursuit, Time Trials, Individual Sprint and Team Spring. Equestrian: Three Dressage events (a Team Test, an Individual Champion Test, and a Freestyle Test) determine an overall score. Football (U.S. Soccer) 5 & 7-a-side: Teams of either five or seven athletes compete for the gold. All outfield players wear blackout masks, to ensure fairness amongst players with differing degrees of visual impairment. Goalball: Introduced to the Paralympics in 1976, goalball consists of opponents on a court attempting to score into the other team’s goal. Judo: Judo is the only martial art on the 2012 Paralympic program, and it is intended for athletes with visual or hearing impairments. Powerlifting: Formerly “Weightlifting,” this sport consists of 20 medal events. Rowing: Paralympic rowing is a relatively new addition to the Paralympic program, appearing this year for only the 2nd time in history. Sailing: Specialized keelboats help Paralympic athletes perform comfortably. Shooting: Athletes use either pistols or rifles to fire at stationary targets. Swimming: One of the most popular Paralympic events, swimming consists of all four basic strokes (Freestyle, Breaststroke, Backstroke, and Butterfly), plus the Individual Medley. Table Tennis: Three classifications, including wheelchair athletes, standing athletes, and athletes with intellectual disabilities, compete for victory. Sitting Volleyball: Two teams of six play a version of volleyball very similar to that of its Olympic counterpart. Wheelchair Basketball: The sport is broadly similar to Olympic Basketball, with the same size court, basket height and the same system of scoring. Wheelchair Fencing: Athletes use three different weapons to score hits against their opponents. Wheelchair Rugby: Only contact between wheelchairs, not physical contact between players, is permissible. Wheelchair Tennis: Similar to Olympic Tennis, except the ball can bounce twice, with the first bounce occurring within the court boundaries. Traveling to the Paralympic Games? Be sure to check out our previous blog entry on travel to the Olympics/Paralympics here, and a run down of some of the most famous special needs athletes here. For your special needs travel equipment rentals, be sure to visit us at www.specialneedsatsea.com. The Paralympic Games this year are posed to be the most watched Paralympics ever, with a record-breaking collection of Rights Holding Broadcasters planning to screen the Games all over the world. Be sure to check your local listings for coverage. We hope you’ll tune in!